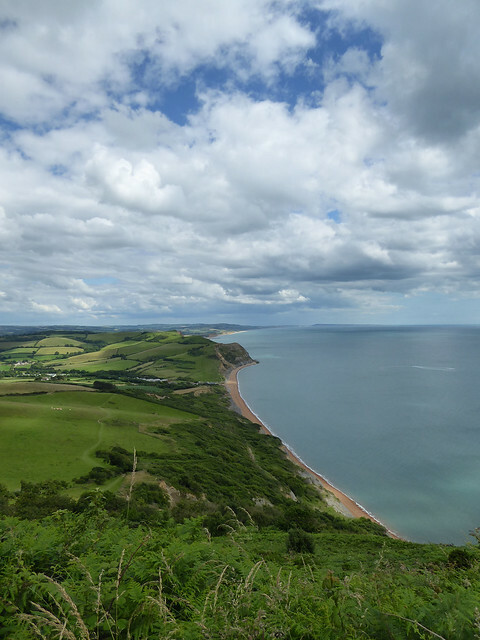 The west Dorset coast with Charmouth to the left. Golden Cap stands out just right of centre. The west Dorset coast contains many wonders but one stands out above all others. This is Golden Cap, the distinctive steep-sided, flat-topped hill with its golden edge and cliffs falling precipitously to the sea. Visible for miles around and rising above all its neighbours, it stands 191 metres above sea level and is the highest point on the south coast of England. It is a local landmark, a place of legend, and an inspiration to writers and artists. The path from Stonebarrrow leading eventually to Golden Cap. Portland can be seen in the distance. I first climbed Golden Cap nearly thirty years ago. It was a mild, early spring weekend and I was entranced by the experience. It’s now one of those places I like to visit periodically so, on a warm mid-July day earlier this year, I set out from the Stonebarrow Hill car park above Charmouth. 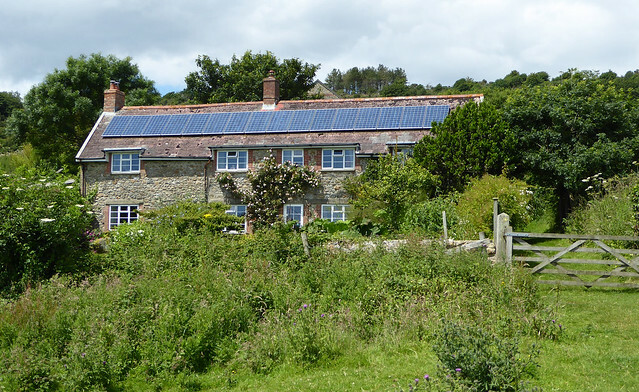 The grassy track descended steeply between brambles and bracken towards Westhay Farm with its mellow stone buildings decorated with roses, honeysuckle and solar panels. I paused in a gateway near the farmhouse to look at one of the hay meadows. Bees and butterflies enjoyed the thick covering of grasses and colourful flowers while the sun gradually won its battle with the clouds. 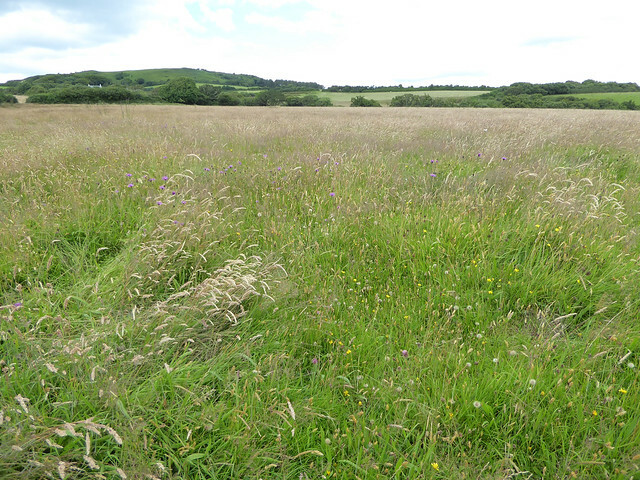 Flower-rich hay meadows were once an important feature of the countryside but they have mostly been lost since 1930 as a result of agricultural intensification. Managed in the traditional way with a late July cut for hay, they support a rich community of invertebrates, birds and flowers. The meadows at Westhay Farm are no exception and rare plants such as the green-winged orchid thrive here. My gateway reverie was interrupted when a fox suddenly appeared in one of the breaks in the meadow. We stood looking at one another, a moment out of time, before the fox lolloped off through the long vegetation. Beyond the farmhouse, the path descended across open grassland dotted with sunny stands of ragwort and tall, purple thistles populated with bumblebees. The sea, a pale steely blue, was now ahead of me, dominating the view. Today it was calm but the slight swell was a warning of its power. Golden Cap loomed to the east like a steep pleat in the coastline and, when the sun shone, the cliff face revealed some of its geological secrets. About half way up, a large area of rough grey rock was visible. This was laid down some 200 million years ago and is mainly unstable grey clays of the Middle and Lower Lias prone to rock falls and mud slides. Towards the summit, tracts of distinctive “golden” rock glowed in the sunshine. The rock here is Upper Greensand, sandstone laid down about 100 million years ago, forming the “cap”. 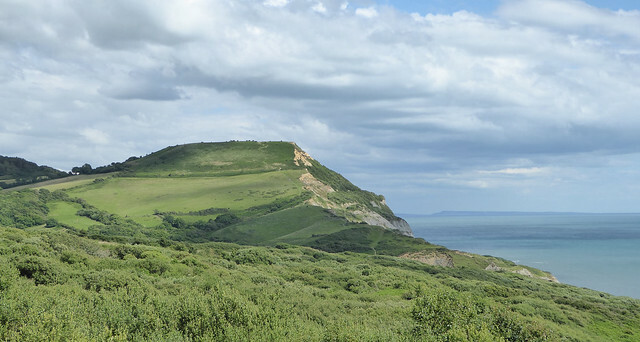 Looking towards Golden Cap; the golden sandstone cap and the grey rock below can be seen despite the vegetation. Golden Cap viewed from the east at Seatown on another day. The golden sandstone cap and the grey rocks beneath can be seen very clearly from this aspect. 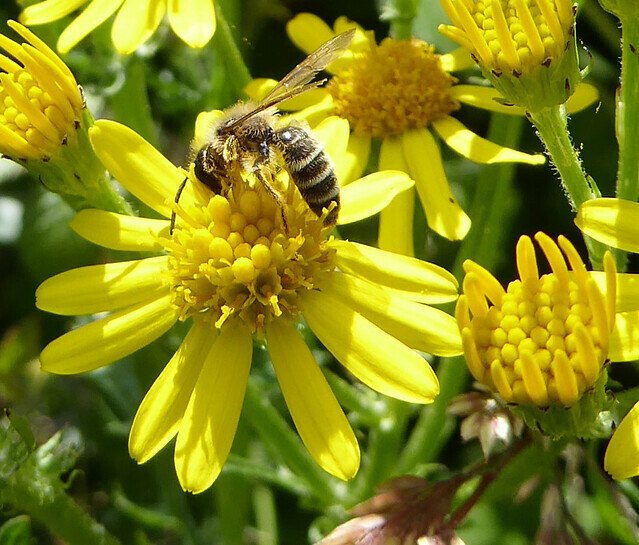 A solitary bee on ragwort, possibly Andrena flavipes. 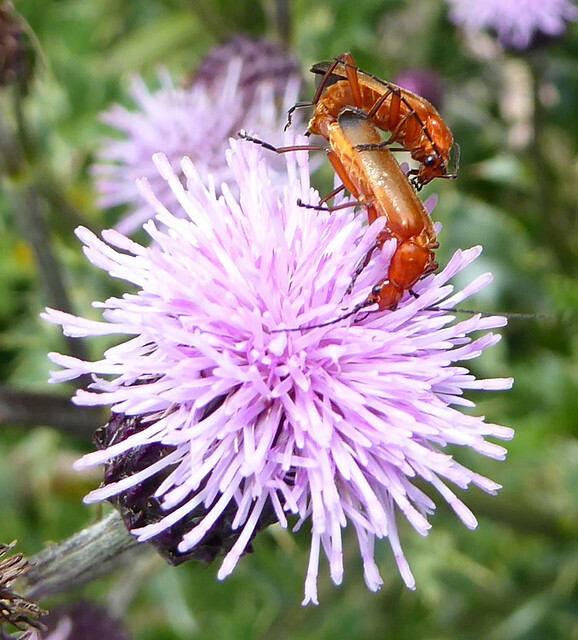 Common red soldier beetles, qualifying for their popular name of “hogweed bonking beetles”. The coast path continued eastwards in a roller coaster fashion. Prominent fingerposts pointed the way and I passed vast inaccessible coastal landslips and descended into deep valleys with rapidly flowing water, only to climb again on the other side. In meadows alongside the path, bees, moths, beetles and butterflies flitted among the many flowers including purple selfheal and knapweed, yellow catsear and meadow vetchling. The final push towards the summit of Golden Cap began very steeply across open grassland before entering a stepped, zigzag track which was easier to negotiate. As the path rose there was a change in the landscape. Bright purple bell heather began to show and bracken surrounded the stepped path; a kestrel hovered briefly above. Suddenly the path levelled out; I had reached the summit and here were the familiar landmarks: a low stone marker informing me how far I had walked and the larger stone memorial to the Earl of Antrim. The dedication told me that the Earl was the Chairman of the National Trust between 1966 and 1977. What it didn’t tell me was that he recognised the importance of preserving our coastline from encroaching development and spearheaded the Enterprise Neptune appeal which led to the purchase of 574 miles of coast saving it for future generations. 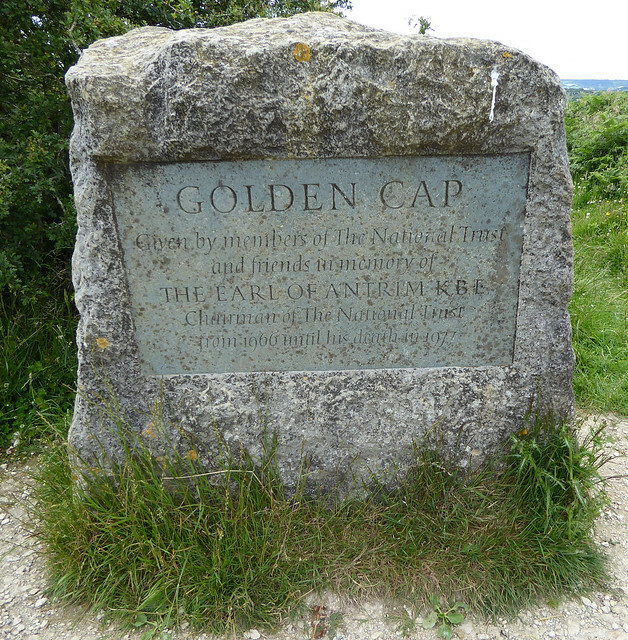 Golden Cap was one of two coastal sites purchased in his memory after he died. The view to the east over Thorncombe Beacon with Portland in the distance. 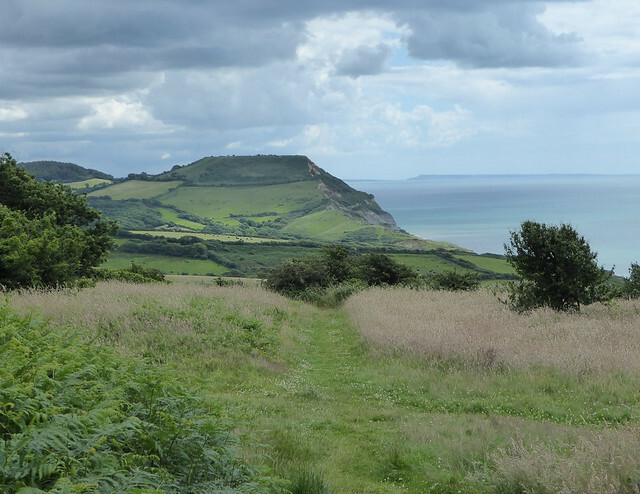 The view to the west towards Lyme Regis and the Devon coastline. 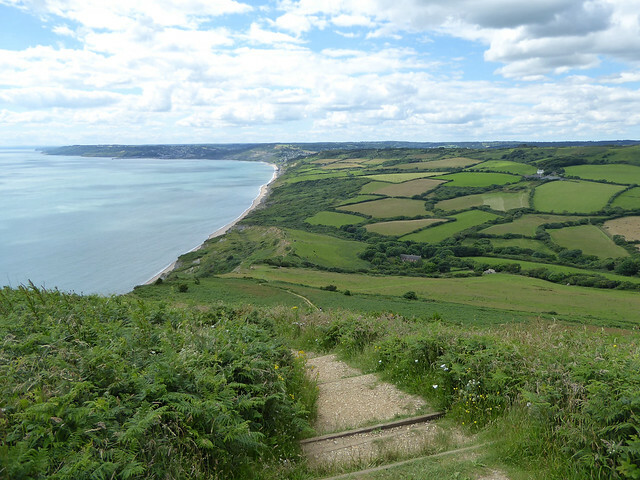 I reminded myself of the long views from this high, flat-topped hill: to the east across Seatown, Thorncombe Beacon, West Bay and Portland, to the west over Lyme Regis and the wide sweep of Devon coastline, to the north across the Marshwood Vale. Looking down, I saw water skiers carving patterns in the sea surface far below. The sea now seemed so far away that I felt momentarily separated from the rest of the world. On my return journey, I headed down and slightly inland to the remains of the 13th century chapel at Stanton St. Gabriel. Set in meadowland beneath the western slope of Golden Cap, the derelict, grey stone walls and the porch of the old chapel are all that remain. There is also a cottage nearby and a large building, originally an 18th century manor house, now restored by the National Trust as four holiday apartments. But why was a chapel built in this isolated spot and why is it now derelict? A settlement existed here for many hundreds of years and Stanton St. Gabriel was mentioned in the Domesday Book (1086). There was a farming community of about 20 families in the vicinity until the 18th century and this was their chapel but the settlement was abandoned when some people were lured to Bridport to work in the flax and hemp industry. 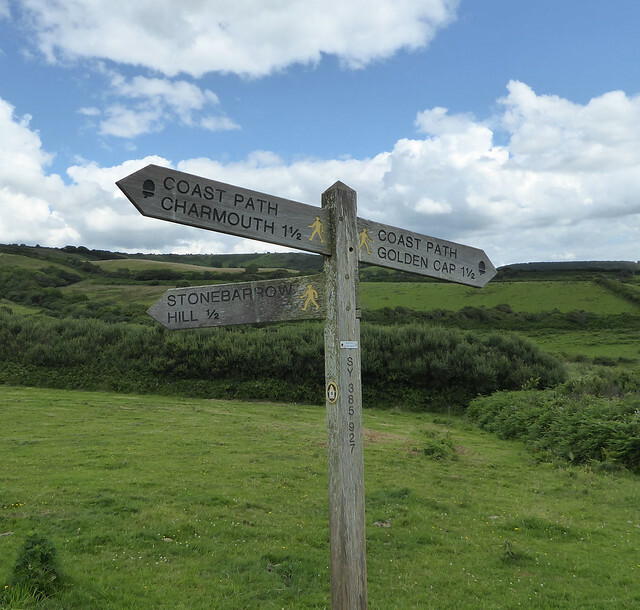 Others may have moved to Morcombelake when the coach road from Charmouth to Bridport along the flank of Stonebarrow Hill was moved away from the settlement to its present route. The derelict chapel at Stanton St Gabriel. 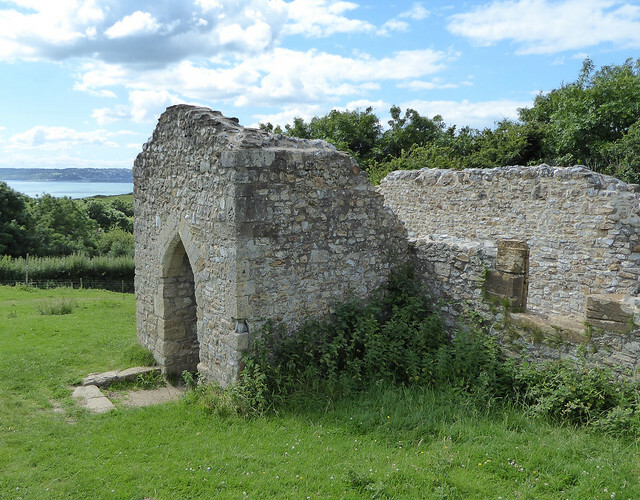 The derelict chapel provides a potent reminder of the community that once lived in this isolated but beautiful spot beneath one of west Dorset’s most striking landmarks, Golden Cap. This article appeared in the September 2016 edition of the Marshwood Vale Magazine. A beautiful account and lovely images. 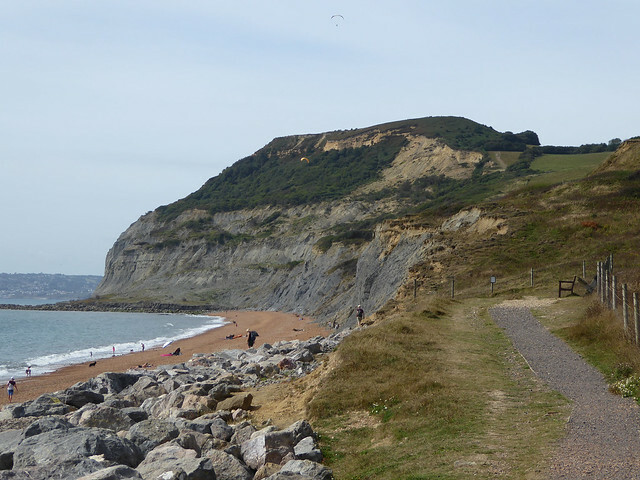 it will encourage many to take that walk to Golden Cap themselves. Thanks Jessica, it is a lovely walk. Thanks Sarah, I also like the idea of farming traditionally and I must go back when the orchids are in flower. I believe there may be Autumn Ladies Tresses in flower now?? It was a real pleasure to read this over my morning coffee. Thank you. Thanks Christina. I cherish the image of you reading about my walk in Dorset as you drink your morning coffee many miles away in Italy. Thanks Amelia. Golden Cap is in the far west of Dorset and I wonder if you lived in Portland that there was already a lot to see close by? I think that must be why. Thanks Dina, it is a wonderful part of the coast and I hope you will climb Golden Cap one day!